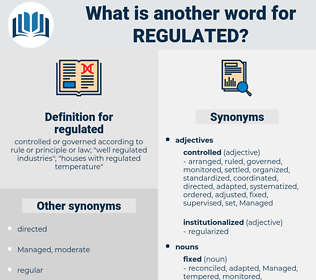 What is another word for regulated? controlled or governed according to rule or principle or law; " well regulated industries"; " houses with regulated temperature"
rule-based, supervised, Legislated, restricted, disciplined, regularized, monitored, controlled, organized, structured, organised, regulatory, standardized, orderly, regular, adjusted, Audited, uncontrolled, prescribed, adjustable, Policed, settled, ozone-depleting, regulation-making, controlling, Administering, normative, covered. rules, restricted, controlled, regulatory, governed, prescribed, covered. Enumerated, statute, status, described, Envisaged, controlled, covered. related, Investigated, illustrated, formulated, guaranteed, articulated, Discriminated, modulated, facilitated, Eliminated, calibrated, coordinated, Enumerated, allocated, delineated, consolidated, Operated, regularised, Adjudicated, incorporated, reorganized, Administered, dictated, mediated, elaborated, arranged, terminated, Liquidated, characterized, implicated, suppressed, scrutinised, implemented, criminalized, revised, Navigated, Enacted, Overseen, measured, triggered, Contemplated, reporting, anticipated, safeguarded, circumscribed, ruled, reproduced, mandated, Steered, enforced, dominated, clarified, revealed, reflected, reconciled, Regarded, reviewed, prohibited, amended, Indicated, estimated, Undertaken, assured, constrained, resolved, Instituted, agreed, Tackled, Assessed, Repaid, Captured, determined, Throttled, treated, ordinance, labelled, sustained, Debated, checked, charter, dedicated, Drafted, identified, advised, imposed, verified, Cited, Hampered, cleared, acknowledged, classified, relevance, protected, outlined, recorded, selected, Construed, recognized, charged, corrected, Reached, retired, insured, Inspected, transmitted, directed, devoted, Influenced, handled, Unliquidated, adapted, Examined, defined, finalized, ensured, supported, guided, Hindered, adopted, conducted, completed, Worked, bound, legalised, competence, solved, Earmarked, Disbursed, noted, informed, sealed, converted, Emerged, accomplished, countered, cured, taught, applied, presented, varied, obliged, Delivered, Termed, predicted, Forwarded, contained, modified, Enshrined, Remedied, Compiled, Taxed, attended, assisted, attached, pursued, justified, tracked, Conformed, prepared, Arrived, Answered, Exercised, forecast, forecasted, fixed, overcome, confined, Enriched, punished, derived, gotthis, finalised, invested, described, Convened, Discussed, produced, entitled, tabled, Performed, impacted, foreseen, documented, considered, disposed, tested, maintained, concluded, Carried, laid, led, discharged, touched, left, Dealt, Entered, embodied, perceived, seized, effected, ended, Afforded, framework, Aimed, employed, Been, placed, Subjected, competency, Allowed, Filed, endorsed, actioned, Avoided, Devised, framed, held, Brought, secured, Provided, Switched, Mentioned, decided, owned, raised, Achieved, acquitted, sponsored, Incurred, affixed, inscribed, mentored, surrounded, Followed, Deemed, conditioned, spent, shared, taken, exposed, owed, Envisaged, built, Coached, sorted, tuned, projected, accompanied, timed, put, committed, planned, embedded, Passed, driven, process, processed, expended, sent, figured, hosted, Viewed, included, headed, Flanked, paid, called, evidenced, backed, run, Claimed, given, finished, known, Fitted, boxed, Met, Shown, found, funded, Approached, gone, seen, based, Counted, done, made, rules, supervised, Legislated, disciplined, monitored, controlled, organized, structured, organised, adjusted, Audited, prescribed, adjustable, Policed, settled, covered. upset, disarranged, indefinite, confused, unfixed. The water was to be regulated, and then the clean - up as soon as the owner came down. It is usually and quite properly regulated for the customers who come in from the streets expecting to get warm without delay. regulate, resolute, rock salt, result, rascality, rockslide.